This center console beauty really gets up and goes. Her sleek lines afford ease of entry and a comfortable ride. The Dusky 217 is built with the same strength and rugged integrity as all of our offshore boat and inshore boat models. Dusky 217 is equipped with the Dusky Drive; a unique fiberglass outboard bracket with integrated swim/dive platform. The Dusky Drive improves maneuverability and stability to your boat while allowing a full transom for safety. Her nearly eight-foot beam makes her perfect for reef hopping, skin diving, water skiing and light fishing in the back country. Our FACTORY DIRECT pricing gives you a lot of boat for a lot less money. Need to custom rig your 217? Our options list lets you outfit her exactly as your require. Designed for the serious offshore fisherman who wants to enjoy the confidence afforded by this sturdy, heavy-duty and dependable DUSKY hull. This center console beauty really gets up and goes. Her sleek lines afford ease of entry and a comfortable ride. 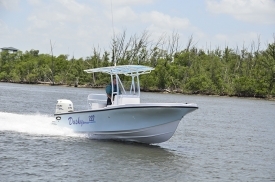 The Dusky 218 RL is built with the same strength, rugged integrity as all of our offshore boat and inshore boat models. Dusky 218 RL is equipped with the Dusky Drive; a unique fiberglass outboard bracket with an integrated swim/dive platform. The Dusky Drive improves maneuverability and stability to your boat while allowing a full transom for safety. Her nearly eight-foot beam makes her perfect for reef hopping, skin diving, water skiing and light fishing in the back country. Our FACTORY DIRECT pricing gives you A LOT of boat for A LOT less money. Need to custom rig your 218? Our extensive list of options lets you outfit her exactly as your require. Designed for the serious offshore fisherman who wants to enjoy the confidence afforded by this sturdy, heavy-duty and dependable DUSKY hull. The Dusky 252 XF is a step V center console and was designed for the serious offshore fisherman who wants to enjoy the confidence afforded by the sturdy, heavy duty and dependable Dusky hull. When you need to get to the fish FAST, you need the performance and economy of the 252. You'll feel comfortable out on the blue water in this rugged center console. Our high, dry sides, roomy interior and smooth ride make Dusky 252 an offshore favorite. Dusky 252 is equipped with the Dusky Drive; a unique fiberglass outboard bracket with integrated swim/dive platform. The Dusky Drive improves maneuverability and stability to your boat while allowing a full transom for safety. Outfit her to your liking with a wide variety of equipment from our extensive options list. Designed for the serious offshore fisherman who wants to enjoy the confidence afforded by this sturdy, heavy-duty and dependable DUSKY hull. And custom made doesn't mean you'll spend a fortune either. Our FACTORY DIRECT pricing means more purchasing power for you.